Hautes-Pyrénées (French pronunciation: ​[ot pi.ʁe.ne]) (Gascon: Nauts Pirenèus / Hauts Pirenèus; Spanish: Altos Pirineos) is a department in southwestern France. It is part of the Occitanie region. 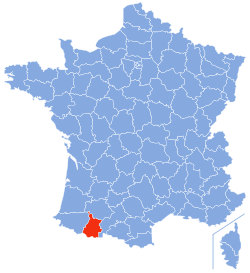 Historically the area broadly covered by the département was known as Bigorre, a territory at times independent but later part of Gascony province. Large parts of the area were held by the English after the Treaty of Brétigny, 1360. 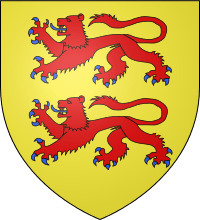 In the 16th century, it was part of the Huguenot domain of the monarchs of Navarre, brought to France by Henri IV. For its early history, see Bigorre and Gascony. 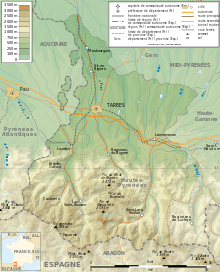 The département of Hautes-Pyrénées was created at the time of the French Revolution, on 4 March 1790, through the influence of Tarbes politician Bertrand Barère, a member of the Convention. Hautes-Pyrénées consists of several distinct geographical areas. The southern portion, along the border with Spain, consists of mountains such as the Vignemale, the Pic du Midi de Bigorre, and the Neouvielle and Arbizon ranges. A second area consists of low-altitude rolling hills. The Northern part of the département consists of largely flat agricultural land. Hautes-Pyrénées has two small territorial exclaves—a remnant from the Middle Ages—located within the neighboring département of Pyrenees-Atlantiques. 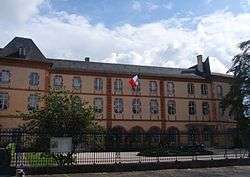 The greater Tarbes area is the economic and administrative focus of the département, while Lourdes, the second-biggest city in Hautes-Pyrénées, is dedicated almost exclusively to the religious pilgrimage industry. Other towns of note are Bagnères-de-Bigorre, Argelès-Gazost, Vic-en-Bigorre, Rabastens-de-Bigorre, Maubourguet, and Lannemezan. The Western Pyrenees National Park covers a significant area, and includes well-known attractions such as the Cirque de Gavarnie and the Pont d'Espagne. The entire area is a favorite destination of hikers and mountain enthusiasts. The area has been known perhaps since Antiquity for its hot springs, and several towns were built around these, most notably Cauterets, Luz-Saint-Sauveur and Bagnères-de-Bigorre. There are a number of popular ski resorts in Hautes-Pyrénées such as Barèges-La Mongie, Gavarnie, Luz-Ardiden, Cauterets, Hautacam, Piau-Engaly and Saint-Lary-Soulan. The area is a nearly-permanent fixture on the Tour de France's itinerary, with legendary passes such as the Tourmalet, the Aubisque and the Soulor. The region's premier avant-garde jazz festival is held each year in Luz-Saint-Sauveur: Jazz a Luz. Tarbes hosts an annual horse festival, Equestria, and a Tango festival, Tarbes en Tango.